One of my favourite moments in the TV series One Foot In The Grave was when Victor and Margaret were unable to sleep because a damaged streetlamp was shining through their bedroom window (when I say “through”, I mean literally that it was poking through into their bedroom). Pacing up and down, Victor declares that he is so bored that he will “open Ronnie and Mildred’s Christmas presents”. Now I don’t have a habit of keeping other peoples’ gifts to myself unopened but last year there was a problem in our house with some Christmas presents to a clutch of far away relatives not getting delivered promptly so that they about in their shiny wrapping in front of my fireplace until Easter. This caused much amusement to any visitors beyond Valentine’s Day. It comes to a point where when the presents are handed on, they are so Christmassy that their point becomes ludicrous. I blame my husband, it’s always his family’s presents this happens with, we can’t guarantee seeing them during the holidays and this is a horrid time of year to go driving about with small children. This year I vowed it wouldn’t happen. I deliberately picked gifts that were reasonably lightweight and could be posted if need be. For the first ten days of January there didn’t seem any urgency and then I got ridiculously busy and haven’t managed to parcel them up and take to the now distance post office since Royal Mail shut the one on my doorstep. You’ll note that it’s ME doing the parcelling, ME doing the posting, ME who is generally doing anything about it. Anyway, I realised that I’d bought this panettone for my sister in law and whilst panettone has a long shelf life, anything beyond Jan 31st is pushing it a bit so we’re going to have to find her something else now. Which is handy in a way since I picked this before I’d planned to post things. So now we have a panettone glut. Herewith, panettone French toast. French toast seems to be a generic term for eggy bread… you’d expect eggy cake to be a bit rich but I’m pleased to report that this was not sicky in the least and with a genereous coating of egg, made for a delightful winter breakfast. The idea came about since my former Italian flat mates used to talk about sprinkling sugar over slices of panettone and popping it under the grill until it caramelised. Therefore it made perfect sense (to me at least) to take this toasted panettone idea a step further. You can serve it on it’s own. Or dress it up with some yogurt, honey and fruit. 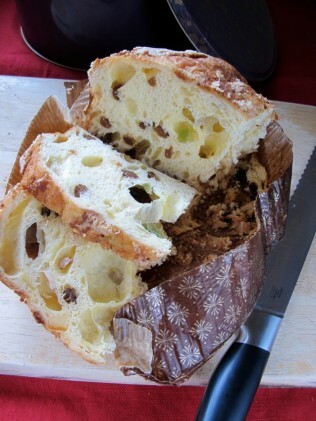 I’m filled with ideas what to do with my left over panettone now. What would you suggest? 1 egg (per 2 slices) lightly beaten, in a wide flat bowl. So easy it barely deserves a recipe. 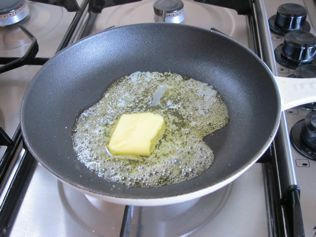 Melt the butter in a heavy based pan. Meanwhile coat each side of the panettone slices in the egg, allowing 10 seconds or so for it to soak in. 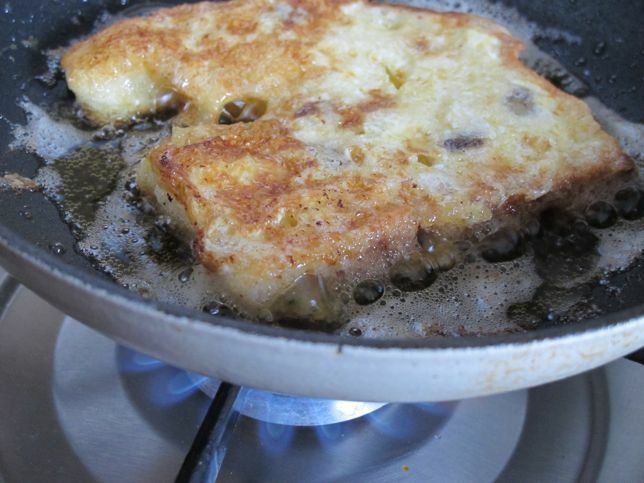 When the pan is sizzling, slide in the eggy panettone and cook on each side until golden brown. Serve immediately with honey, fruit, yogurt as desired. Bacon and cake?! Bring it on!! Good idea making this as french toast Sarah. 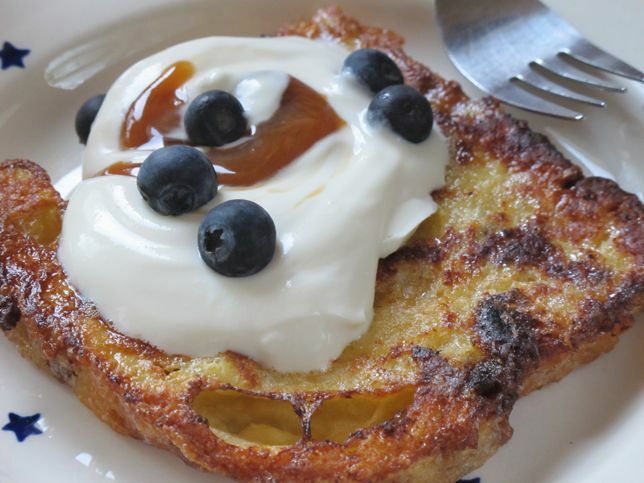 It would certainly give regular bread French toast a run for its money! Not sure I could go back to normal French toast after doing the cake version! Yum! What a great breakfast, lunch, snack or dinner! I’d be happy eating it all day! I will tweet it. Everybody could use some French toast inspiration. That looks yummy! Nigel Slater does a panettone bread and butter pudding, which I’ve been meaning to try for ages and ages. Oh, and I totally sympathise with being the only one who has anything to do with present buying! Boys just seem to get out of it, even it’s their family! I know… every year I swear to have less and less to do with it but then I panic at last minute and do it for him. Thank you, the plate is by Emma Bridgewater, Starry Skies range I think and still available so far as I know. 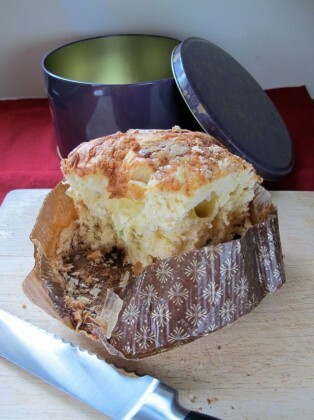 Could you use the left over panettone for a bread and butter pudding? Might be scrummy! Apparently yes – one vote for Nigel Slater above! Great way to use up panettone. It freezes well,I use mine up in panettone bread and butter pudding. Good call. I may freeze a chunk. This is one of my favourite breakfasts! Had it for boxing day breakfast and have done for the past few years. It’s becoming a bit of a tradition. 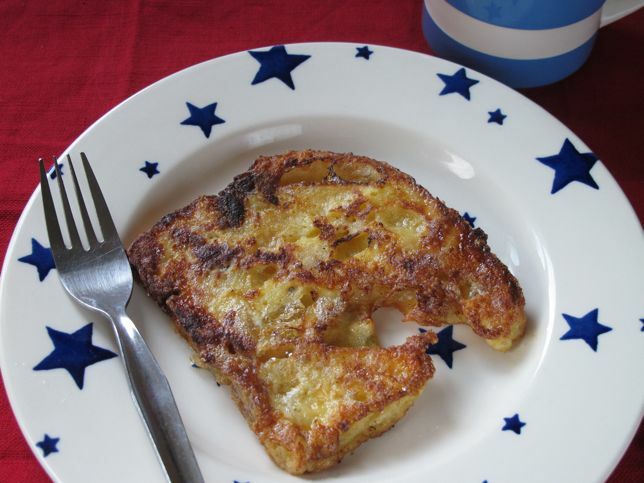 I love French Toast – it was one of the first things I posted about! Now you’ve got me craving this again! I like traditions like that. I suspect this will become one of ours too. 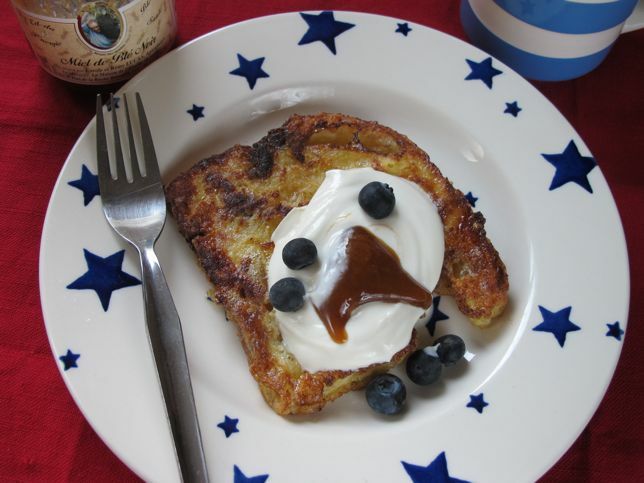 Love the luxury use of the brioche to jazz up the French toast – looks delicious! Bet you were glad you couldn’t give that one away! Looks divine. 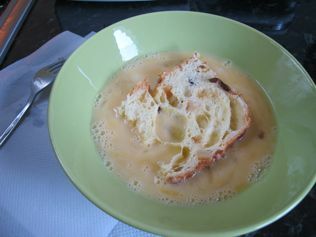 We had a savoury bread and butter pudding for lunch today made from my DH’s sandwich from yesterday. He had a migraine and didn’t eat it. It’s that same bread/egg combo just in case you wonder what I’m havering about. On the present front. I have a bag of Christmas pressies waiting to be deliver to my DH’s rellies. Frost and snow stopped us visiting them and them visiting us. Could well be Easter before they get them! Nothing edible though. What a fabulous breakfast. Love all that butter you cooked it in. Julia would be proud! What a great idea, you must buy his family all fabulous perishable gifts in future in the hope of more Christmas left over yumminess. That final shot with the blueberries has me drooling. I’d forgotten how good French Toast is – it’s pure comfort food for me. Unfortunately I can’t make it as I’ve got a completely gluten-free kitchen. I wonder where I can get it though? I’m sure I’ve seen it on some menus but can’t remember. Definitely go with the comments for B&B Pud too.